I hope you all had fun for Read Across America day. Below is a picture of me dressed in my full-body pajamas ( with the footies ). The dinosaurs even GLOW IN THE DARK!!! My 5th graders loved it. We all had on our pajamas and had our own Read-A-Thon. Students brought in their favorite stuffed animal and we just relaxed around the classroom and read all day. 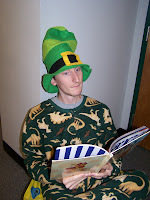 Please email me your fun pictures from Dr. Seuss day and I will post them on this blog. Just email me at: [email protected] and I will upload your picture to this blog post.